Heat oven to 375ºF. Make cookies as directed on pouch, using oil and egg. Cool completely, about 30 minutes. In small bowl, stir frosting and peanut butter until smooth. 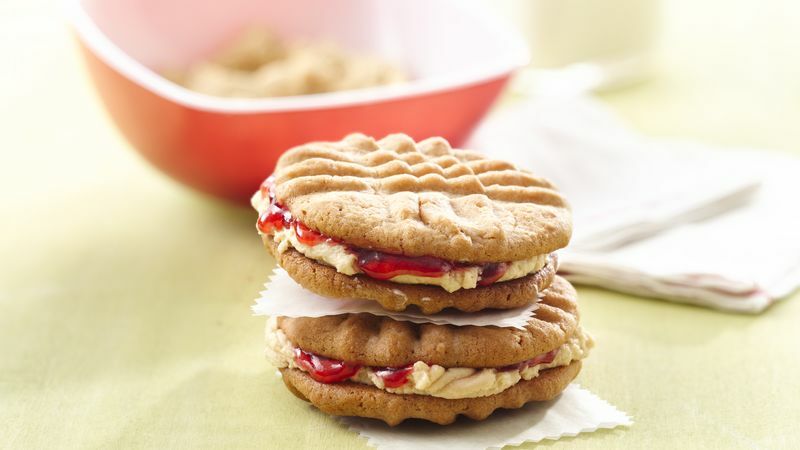 For each sandwich cookie, spread generous teaspoon frosting mixture on bottom of 1 cookie; spread scant teaspoon jelly over peanut butter mixture. Top with another cookie, bottom side down. Triple PB&J Sandwich Cookies: Make cookies as directed. In microwavable bowl, microwave 1 package (300 g) peanut butter chips and 2 teaspoons shortening uncovered on High about 1 minute or until almost melted; stir until smooth. If necessary, microwave additional 5 seconds at a time. Dip half of each sandwich cookie into mixture. Immediately roll outside of frosted edge in chopped peanuts. Lay flat to dry. Do-Ahead Keep a stash of baked cookies in the freezer ready to be filled and served. Variation You can make sandwich cookies with Betty Crocker™ chocolate chip and sugar cookie mixes, too.